I1307K and E1317Q polymorphism in the APC gene in colorectal cancer patients and two groups in Colombian population. Colorectal cancer (CRC) represents an important cause of death, in both developed and developing countries. APC gene I1307K polymorphism has been particularly associated to an increased risk of this type of cancer in Ashkenazi Jews, while E1317Q polymorphism has been associated to several populations. Our purpose was to determinate the frequency of APC gene I1307K and E1317Q variants and their possible association with to CRC in three groups of Colombian individuals. We studied a total of 263 persons distributed in 3 groups: a group of sporadic CRC patients (62), a control group of adults aged over 75 years old (100), with no previous history of cancer (ten years older than the average age for sporadic cancer, expecting a relatively low probability of developing CRC). And a group (at risk) of individuals aged less than 5 years old (100). DNA was extracted and polymorphisms were then amplified by ARMS PCR (amplification refractory mutation system). The results were visualized on agarose and polyacrylamide gels. The proportions for APC gene polymorphisms K1307 and Q1317 were low among the three groups of individuals and no statistically significant differences were found. In conclusion no association was found for a K1307 and/or Q1317 allele carrier and the risk of developing colorectal cancer. Colorectal cancer (CRC) is the second cause of death for cancer in developed countries, while in developing countries it is the sixth or seventh cause of death [1 - 2], CRC is the 5th cause of death for cancer in Colombia, according local studies and to adjusted international data, but its incidence is increasing [3 - 4]. The mutations sequence of colorectal cancer were described two decades ago  and the first mutation usually occurs in the APC gene . Most CRC are sporadic (75%-80%), approximately 20% are familial and 5% are hereditary . The APC gene mutations are present in 80% of sporadic colorectal cancer and appear very early in the tumor progression .The APC gene is located on chromosome 5q21, it has 21 exons, 15 of them functional . The exon 15 contains more than 75% of the 8.535 base pairs. The APC gene encodes a protein of 2,843 amino acids and has 310 kDa of molecular weight [6, 9 -10]. APC protein is localized in both the cytoplasm and the nucleus, is constitutively expressed within the normal colonic epithelium and supports and maintains tissue architecture [9 - 10].APC I1307K and E1317Q variants have been linked to CRC [11-12]. I1307K APC variant results from the T to A transition at nt 3920, which causes an extended mononucleotide tract (A8) repeat, impairing replication fidelity and forming a mutational hotspot. I1307K, variant have been observed in 6.1% Ashkenazi Jewish population, in 10.4% of Ashkenazi CRC patients and in 28% of same population with family history CRC, but in any of 243 non-Jewish controls . This association also has been found in other Ashkenazi populations, USA (Petrukhin, Locker&Syngal), U.K. (Frayling,&Lamlum) Canada (Gryfe) and Israel (Drucker, Figer, Fidder) in Increased frequency of I1307K variant has consistently been observed in Ashkenazi population in USA, Canada, U.K and Israel, This association has also been observed in a Turkish non Jewish population , but not in many other populations: U.K. [14-15]. The E1317Q variant involves a guanine change to cytosine, leading to glutamic acid being substituted for glutamine. The E1317Q APC variant has also been associated to an increased risk of colorectal cancer in Jewish and non-Jewish populations [12 - 16],, although some studies have not found this association [17 - 18].These polymorphisms have not yet been studied In Colombia, or in any other Latin American country. The present investigation searched for the frequency and possible association of these polymorphisms in a group of sporadic colorectal cancer patients and two other groups of Colombian individuals: children and elderly. Three groups of Colombian individuals were analyzed. These consisted of 62 patients with sporadic colorectal cancer, and two control groups: 100 elderly adults older than 75 years old, without antecedents of colorectal cancer, and 100 individuals aged less than 5 year old. Colorectal cancer patients do not accomplish the Bethesda guidelines or Amsterdam criteria. Peripheral blood was taken from all individuals from the first two groups, after a signed informed consent. Children DNA samples were obtained randomly and anonymously within a group of children referred for paternity testing, whose mothers signed an informed consent for additional genetic population studies. These blood samples were taken on FTA paper (Whatman Inc., Clifton, NJ). Genomic DNA was isolated from peripheral blood lymphocytes according to the salting out procedure, for the cancer patients and elderly control group . For the younger control group DNA was obtained by the method established for FTA disks . 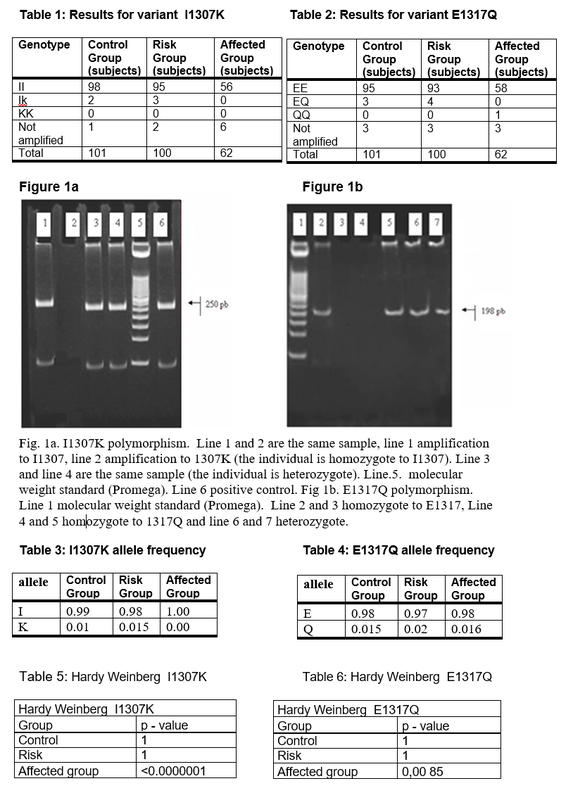 DNA was amplified by ARMS-PCR methodology, according protocol described by Frayling  for I1307K polymorphism and Popat  for the E1317Q polymorphism. Electrophoresis of the amplified products was carried out in 1.5% agarose gels and 12% polyacrylamide gels. Figures 1a and 1b show the amplified product for each polymorphism and molecular weight marker. Genotypic frequencies for I1307K and E1317Q polymorphisms are shown in tables 1 and 2. Allelic frequencies are shown in tables 3 and 4. No statistical differences were found among different groups. Both polymorphisms were in HW equilibrium for the young and elder control groups and in disequilibrium for cancer patient group (p<0.0000001 for I1307K and p=0.0085 for E1317Q). No increased K allele or Q allele frequencies were found in the cancer patients group as would have been expected if there had been an association between the carrier of these variants and the risk of developing colorectal cancer (Tables 3 and 4).Five heterozygotes (IK) were detected for the I1307K variant, two in the elderly control group and three in the younger control group. This polymorphism was not observed in the affected group. For the E1317Q polymorphism, seven heterozygotes (EQ) were found in three in the elder control group and four in the younger control group. One homozygote (QQ) was found for the Q allele in the affected group.Our results did not find any association of the studied polymorphisms to colorectal cancer, as was found by Frayling et al. in Ashkenazi population . These lack of association was also found in Sweden  and in Croatia Studies of APC gene I1307K and E1317Q variants are thus controversial and it is still not clear if they are directly associated to colorectal cancer in some other population as they are not in these Colombian populations. Even though I1307K and E1317Q polymorphism frequency was low in all groups studied here, it would be very useful to increase sampling size for a better appreciation of these polymorphisms in CRC. Peto J. Cancer epidemiology in the last century and the next decade. Nature. 2001;411:390-95. Jemal A, Siegel R, Ward E, Hao Y, Xu J, Thun MJ. Cancer statistics, 2009. CA Cancer J Clin. 2009;59:225-49. Ángel L, Giraldo A and Pardo C. Mortalidad por cánceres del aparato digestivo en Colombia entre 1980 y 1998. Análisis de tendencias y comparación regional. Rev Fac Med Univ Nac Colomb. 2004;52:19 - 37. GLOBOCAN. Cancer Incidence, Mortality and Prevalence Worldwide. Summary table by population. Colombia, Mortality. Males and females. GLOBOCAN 2002 database. 2002. http://www-dep.iarc.fr/globocan/globocan.html 2000. Vogelstein B, Fearon ER, Hamilton SR, Kern SE, Preisinger AC, Leppert M, Nakamura Y, White R, Smits AM and Bos JL. Genetic alterations during colorectal-tumor development. N Engl J Med. 1988;319:525-32. Fearnhead N, Britton M and Bodmer W. The ABC of APC. Human Molecular Genetics. 2001;10:721-33. de la Chapelle A. Genetic predisposition to colorectal cancer. Nat Rev Cancer. 2004;4:769-80. Narayan S, Roy D. Role of APC and DNA mismatch repair genes in the development of colorectal cancers. Mol Cancer. 2003;2:41. Goss KH, Groden J. Biology of the adenomatous polyposis coli tumor suppressor. J Clin Oncol. 2000;18:1967-79. Bienz M. The Subcellular destinations of APC proteins. Nat Rev Mol Cell Biol. 2002;3:328-38. Laken SJ, Petersen GM, Gruber SB, Oddoux C, Ostrer H, Giardiello FM, Hamilton SR, Hampel H, Markowitz A, Klimstra D, Jhanwar S, Winawer S, Offit K, Luce MC, Kinzler KW, Vogelstein B. Familial colorectal cancer in Ashkenazim due to a hypermutable tract in APC. Nat Genet. 1997;17:79-83. Frayling IM, Beck NE, Ilyas M, Dove-Edwin I, Goodman P, Pack K, Bell JA, Williams CB, Hodgson SV, Thomas HJW, Talbot IC, Bodmer WF and Tomlinson IPM. The APC variants I1307K and E1317Q are associated with colorectal tumors but not always with a family history. PNAS. 1998;95:10722-27. Dundar M, Caglayana AO, Saatcia C, Karacab H, Baskolc M, Tahiria S and Ozkula Y. How the I1307K adenomatous polyposis coli gene variant contributes in the assessment of risk of colorectal cancer, but not stomach cancer, in a Turkish population. Cancer Genet Cytogenet 2007;177:95-7. Drucker L, Shpilberg O, Neumann A, Shapira J, Stackievicz R, Beyth Y, Yarkoni. Adenomatous Polyposis Coli I1307K Mutation in Jewish Patients with Different Ethnicity. Prevalence and Phenotype 2000 ;88: 755-760. Evertsson S, Lindblom A, Sun XF. APC I1307K and E1317Q variants are rare or do not occur in Swedish colorectal cancer patients. Eur J Cancer. 2001;37:499-502. Kapitanović S, Cacev T, Radosević S, Spaventi S, Spaventi R, Pavelić K. APC gene loss of heterozygosity, mutations, E1317Q, and I1307K germ-line variants in sporadic colon cancer in Croatia. Exp Mol Pathol. 2004;77:193-200. Lamlum, H., Al Tassan, N., Jaeger, E., Frayling, I., Sieber, O., Reza, F. B., Eckert, M., Rowan, A., Barclay, E., Atkin, W., Williams, C., Gilbert, J., Cheadle, J., Bell, J., Houlston, R., Bodmer, W., Sampson, J., and Tomlinson, I. Germline APC variants in patients with multiple colorectal adenomas, with evidence for the particular importance of E1317Q. Hum. Mol. Genet. 2000;9:2215–21. Hahnloser D, Petersen GM, Rabe K, Snow K, Lindor NM, Boardman L, Koch B, Doescher D, Wang L, Steenblock K and Thibodeau SN. The APC E1317Q Variant in Adenomatous Polyps and Colorectal Cancers. Cancer Epidemiol Biomarkers Prev. 2003;12:1023-8 Miller SA, Dykes DD and Polesky HF. A simple salting out procedure for extracting DNA from human nucleated cells. Nucl. Acids Res. 1988;16:1215. FTA® Protocols: Collect, Transport, Archive And Access Nucleic Acids…All at Room Temperature. Whatman, www.whatman.com. 2002. Popat S, Stone J, Coleman G, Marshall G, Peto J, Frayling I, Houlston R. Prevalence of the APC E1317Q variant in colorectal cancer patients. Cancer Lett. 2000;149:203-6. Gryfe R. Nicola N, Lal G, Gallinger S, Redston M. Inherited Colorectal Polyposis and Cancer Risk of the APC I137K Polymorphism. Am. J. Hum. Genet.1999; 64:378-384. Loker G, Kaul K, Weinberg D, Zoran G, Gong G, Peterman A, Lynch J, Klatzco L, Olopade O, Bomzer C, Newlin A, Keenan E, Tajuddin M, Knezetic J, Coronel S, Lynch H. The I3107K APC polymorphism in Ashkenazi Jews with colorectal cancer: clinical and patholohic features. Cancer Genetics and Cytogenetics. 2006;169: 33-38 Fidder H, Figer A, Geva R, Flex D, Schayeck H, Avidan B, Meir S, Friedman E. Genetic Analyses in Consecutive Israeli Jewish Colorectal Cancer Patients. American Journal of Gastroenterology. 2005; 100:1376-1380- Guo J, Lim R, Soo R, Leong A, Lee S. APC I1307K and the E1317Q variants are not present in Chinese colorectal cancer patients. Genet Med. 2004;6:237–238. Rozek L, Rennert G, and Gruber S. APC E1317Q Is Not Associated with Colorectal Cancer in a Population-Based Case-Control Study in Northern Israel.Cancer Epidemiol Biomarkers Prev. 2006;15: 2325- 2327. Figer A, Shtoyerman R, Tamir A, Geva R, Irmin L, Flex D, Theodor L, Sulkes A, Sadetzki S, Bar S, and Friedman E. Phenotypic characteristics of colo-rectal cancer in I1307K APC germline mutation carriers compared with sporadic cases.British Journal of Cancer. 2001; 85: 1368–1371. Hall M, Liberman E, Dulkart O, Galazan L, Sagiv E, Shmueli E, Kazanov D,Hallak A, Moshkowitz M, Figer A, Kraus S, Inbar M,Neugut1 A, and Arber N.Risk of colorectal neoplasia associated with the adenomatous polyposis coli E1317Q variant. Annals of Oncology. 2009. Strul H, Barenboim E, Leshno M, Gartner M, Kariv R, Aljadeff E, Aljadeff Y, Kazanov D, Strier L, Keidar A, Knaani Y, Degani Y, Alon-Baron L,Sobol-Dvory H, Halpern Z, and Arber N. The I1307K adenomatous polyposis coligene variant does not contribute in the assessment of risk for colorectal cancer in Ashkenazi Jews. Cancer Epidemiol Biomarkers Prev. 2003; 12: 1012–1015. Stern HS, Viertelhausen S, Hunter AG, O'Rourke K, Cappelli M, Perras H, Serfas K, Blumenthall A, Dewar D, Baumann E, Lagarde AE. APC I1307K increases risk of transition from polyp to colorectal carcinoma in Ashkenazi Jews. Gastroenterology. 2001;120: 392–40. Syngal, S, Schrag, D, Falchuk, M, Tung N, Farraye FA, Chung D, Wright M, Whetsell A, Miller G, Garber JE. Phenotypic characteristics associated with the APC gene I1307K mutation in Ashkenazi Jewish patients with colorectal polyps. JAMA. 2000;284: 857–860 Petrukhin L, Dangel J., Vanderveer L., Costalas J., Bellacosa A., Grana G.,Daly M., and Godwin2 A. The I1307K APC Mutation Does Not Predispose to Colorectal Cancer in Jewish Ashkenazi Breast and Breast-Ovarian Cancer Kindreds. Cancer Research. 1997; 57:5480-5484. Bougatef K, Marrakchi R, Ouerhani S , Sassi R, Moussa A, Kourda N, Blondeau Y., Najjar T, Ben Jilani S, Soubrier F, Ben Ammar Elgaaied A. Recherche chez des patients tunisiens d’une e´ventuelle association entre le variant D1822V du ge`ne APC et le de´veloppement du cancer colorectal sporadique. Pathologie Biologie. 2009;57:e67-e61 Gryfe R,Nicola N, Lal G, Gallinger S, and Redston M. Inherited Colorectal Polyposis and Cancer Risk of the APC I1307K Polymorphism. Am. J. Hum. Genet.1999; 64:378–384. Shtoyerman-Chen R, Friedman E, Figer A, Carmel M, Patael Y, Rath P, Fidder HH, Bar-Meir S, Theodor L. The I1307K APC polymorphism: prevalence in non-Ashkenazi Jews and evidence for a founder effect. Genet Test. 2001;5:141-6. Patael Y, Figer A, Gershoni-Baruch R, Papa MZ, Risel S, Shtoyerman-Chen R, Karasik A, Theodor L, Friedman E. Common origin of the I1307K APC polymorphism in Ashkenazi and non-Ashkenazi Jews. Eur J Hum Genet. 1999;7:555-9. Sieber O, Lipton L, Heinimann K, Tomlinson I. Colorectal tumourigenesis in carriers of the APC I1307K variant: lone gunman or conspiracy? J Pathol. 2003;199:137-9. Prior TW, Chadwick RB, Papp AC, Arcot AN, Isa AM, Pearl DK, Stemmermann G, Percesepe A, Loukola A, Aaltonen LA, De La Chapelle A. The I1307K polymorphism of the APC gene in colorectal cancer. Gastroenterology. 1999;116:58-63. Gismondi V, Bonelli L, Sciallero S, Margiocco P, Viel A, Radice P, Mondini P,Sala P, Montera MP, Mareni C, Quaia M, Fornasarig M, Gentile M, Pietro G, Rossini P, Arrigoni A, Meucci GM, Bruzzi P, Varesco L. Prevalence of the E 1317Q variant of the APC gene in Italian patients with colorectal adenomas. Genet Test. 2002;6(4):313-7. Fearnhead NS, Wilding JL, Winney B, Tonks S, Bartlett S, Bicknell DC,Tomlinson IP, Mortensen NJ, Bodmer WF. Multiple rare variants in differentGenes account for multifactorial inherited susceptibility to colorectalAdenomas.Proc Natl Acad Sci U S A. 2004;101:15992-7. Woodage T, King SM, Wacholder S et al. The APC I1307K alleleand cancer risk in a communty-based study of Ashkenazi Jews.Nat Genet 1998; 20: 62–5 Shtoyerman-Chen R, Friedman E, Figer A et al. The I307K APCpolymorphism: prevalence in non-Ashkenazi Jews and evidence fora founder effect. Genet Test 2001; 5: 141–6. Bahar AY, Taylor PJ, Andrews L et al. The frequency of foundermutations in the BRCA1, BRCA2 and APC genes in AustralianAshkenazi Jews. Cancer 2001; 92: 440–5. Rozen P, Naiman T, Strul H et al. Clinical and screeningimplications of the I1307K adenomatous polposis coli gene variantin Israeli Ashkenazi Jews with familial colorectal neoplasia. Cancer2002; 94: 2561–8. Zauber NP, Sabbath-Solitare M, Marotta SP, Bishop DT. Thecharacterization of somatic APC mutations in colonic adenomasand carcinomas in Ashkenazi Jews with the APC I1307K variantusing linkage disequilibrium. J Pathol 2003; 199: 149–51. Zhou XL, Eriksson U, Werelius B, Kressner U, Sun XF, Lindblom A. Definition of candidate low risk APC alleles in a Swedish population. Int J Cancer. 2004 Jul 1;110:550. Fearnhead NS, Wilding JL, Winney B, et al. Multiple rare variants indifferent genes account for multifactorial inherited susceptibility to colorectal adenomas. Proc Natl Acad Sci U S A 2004;101:15992 – 7. Michils G., Tejpar S., Fryns JP., et al. Pathogenic mutations and rare variants ofthe APC gene ide.ntified in 75 Belgian patients with familial adenomatouspolyposis by fluorescent enzymatic mutation detection (EMD). Eur J HumGenet 2002;10:505 – 10. Heinimann K,, Thompson A., Locher A., et al. Nontruncating APC germ-linemutations and mismatch repair deficiency play a minor role in APCmutation-negative polyposis. Cancer Res 2001;61:7616 – 22. White S., Bubb VJ., Wyllie AH. Germline APC mutation (Gln1317) in a cancerpronefamily that does not result in familial adenomatous polyposis. GenesChromosomes Cancer 1996;15:122 – 8.